From the moment you meet Morgan & Evan, you instantly love them. We definitely did! It’s because of the way she glows when she looks at him and the pride that he is beaming over her. 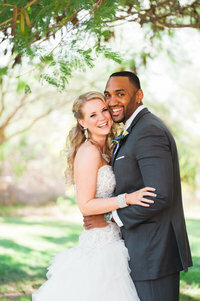 Morgan & Evan were married on Sunday, March 26th at the beautiful Sassi venue in North Scottsdale and our associate photographer, Chad had the honor of photographing the day. Sassi is iconic for their grand entryway, stunning ceremony space and the desert view that can’t be topped. 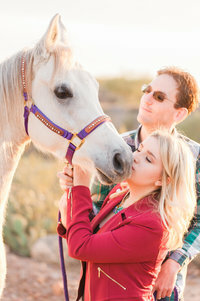 If there’s a way to treat your out of town guests to a day in the desert, Sassi provides it! As Morgan stepped into her lace wedding gown, she was smiling ear to ear. Her bridesmaids stood in awe at what a gorgeous bride was before them! She truly looked stunning! Everyone was emotional as Morgan & Evan saw one another for the first time that day! 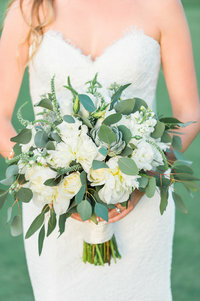 The wedding was trimmed perfectly in pastel colors, from the bridesmaids dresses to the cake and centerpieces, the soft palette complemented Sassi’s natural desert beauty! 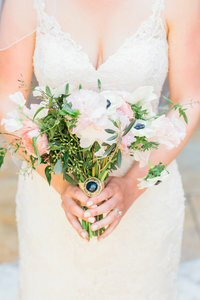 The groomsmen looked dapper in their grey suits with a simple succulent boutonniere and the bridesmaids held the most beautiful arrangements of anemone and garden roses! If one word could describe the day, it would be pure joy – wait, is that two words? As husband & wife, Morgan & Evan will tackle low points and celebrate all the high points together as one. Together, their marriage will stand strong and go far. Congratulations, Morgan & Evan! We love you two and are so excited for this journey you’re on! 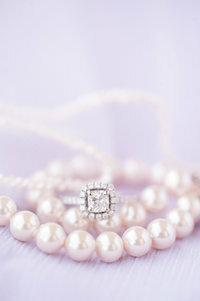 If you loved Morgan & Evan’s wedding, you may also like our other weddings!